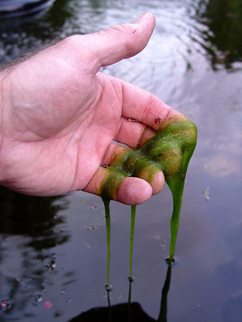 Understanding pond algae, keeping your pond clean and finding the right control solutions or water treatments for pond algae problems may seem like an ugly task to most Rochester, NY pond owners. Finding a balanced growth of healthy pond algae is really quite easy once you have a general understanding of a few basic principles and pond water treatments. As long as you remember, "There is no such thing as an algae free pond", you will have a better grasp on the subject. Pond algae is a sign of a healthy ecosystem. 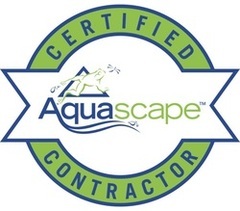 Typically a new pond, a year old, or less, may experience a couple of stages where algae is more prevalent than on that of a mature pond even if you have a regimented water treatment routine. 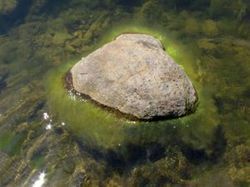 Even on mature ponds, it is not uncommon to experience algae blooms during the change of seasons from winter to spring or during the hottest days of summer when we get extreme heat waves. Click the photo to learn about water treatments. The improper usage or complete lack of natural water treatments promotes pond algae. A pond is only as healthy as the water in it. It is important to use the proper pond water treatments necessary to create a balanced, healthy, and happy pond. Treating pond algae with pond chemicals is not a long term solution to this pond problem. It’s a quick fix that puts additional stress and loads on your pond. So take care and read all directions before just dumping into your pond. Click the photo to learn about pond fish. 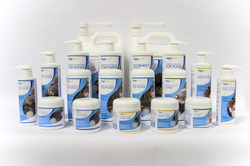 The frequency, quantity and quality of food offered to your fish can promote pond algae. Feed your fish less than you would like. 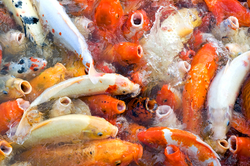 Undigested fish food is the primary pollutant in many ponds. Your fish consume many things in the pond including algae. 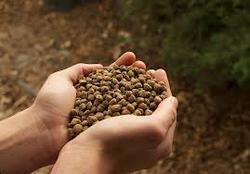 Excessive food increases waste and nutrients that feed the algae. Ponds overloaded with to many fish also become harder to keep in balance. During algae blooms reduce or eliminate feeding until it is under control. Click the image to learn about our pond filtration systems for Rochester, Monroe County area ponds. 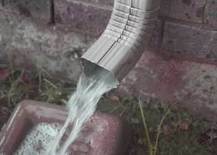 Try to keep runoff to a minimum. The annual ritual of the spring clean-out for the pond or water garden is just the answer. Physically changing the water in your pond, not just treating it, immediately reduces nutrient levels. Removing the leaves, branches, sludge, and other organic debris in your pond removes the source of nutrient build up. 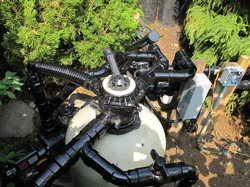 Cleaning your filters and starting up your pond system starts breaking down and controlling the remaining nutrients. Got Pond Algae in Rochester? We can help!